The two volumes 1a and 1b by Alexander Khalifman are the revised editions(2006) of his Volume 1, released in 2000. 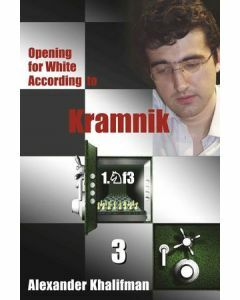 It is probably one of the largest revised edition in chess publishing history. Volume 1a covers the Old Indian Defence, Anti-Gruenfeld, and less popular lines of the Kingâ€ s Indian Defence..
Volume 1b is devoted to the contemporary variations of the classical system of the Kingâ€ s Indian Defence. The author classifies into that group the lines in which after: 1.Nf3 Nf6 2.c4 g6 3.Nc3 Bg7 4.e4 d6 5.d4 0-0 6.Be2 e5 7.0-0, Black plays 7...exd4, 7...Na6, or 7...Nc6. This Second volume discusses a broad variety of systems beginning with 1.Nf3 and 2.c4. This includes a repertoire against Nimzo-Indian and Queen's Indian setups by Black, a large section on Hedgehog systems, and a Symmetrical English section on 1.Nf3 Nf6 2.c4 c5 3.Nc3 Nc6 4.g3. Incidentally a revised edition of Volume 2 has been released in 2008 (352 pages) see helpful response below for link. This Third volume examines the Maroczy system, English Opening with 1...c5, Modern Defence, Dutch Defence and some rare lines. The Fourth book of the series provides a weapon against the Slav, Semi-Slav, Queen's Gambit Accepted and other less popular systems. The Fifth book of the series examines the Queen's Gambit Declined - one of the favorite weapons of choice in many world title encounters. Hello Jiri, the last to links at the end of your post are not working anymore. I would be especially interested in the 2nd revised edition of the Book 2 from 2008, in PDF or DJVU. I have all the other books from this series. If you could reupload this one, it would be so generous and kind. Thank you very much! A refreshed address would be great! Please try the individual links and they are still working. The last two links that are a collection of the above seems not to be working. sorry but solidfiles.com site has virus, unable to open the link. so can this be shared in zippy. thank you once again.